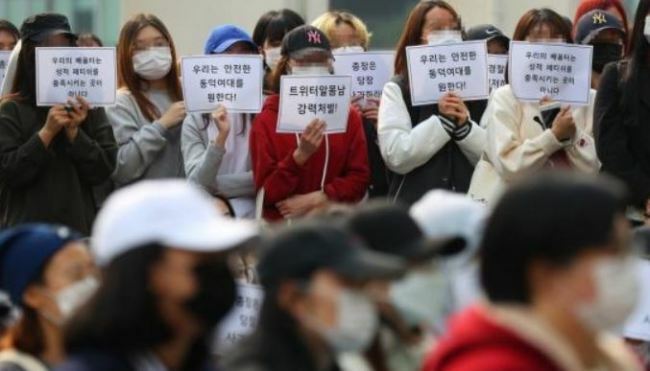 After students’ calls for action against trespassing on campus by people to commit sexual acts, Dongduk Women’s University officials announced measures Sunday to prevent recurrences. From November, non-registered members of the public will not be able to enter campus grounds, including food delivery men and taxi drivers. School identification card readers will also be installed in front of all campus buildings, according to school authorities. Initially, the school had rejected students’ demands for card readers, citing budgetary issues. The university also said it had disinfected spots where the man allegedly took naked pictures of himself and said it would replace all water dispensers on each floor with new ones. This falls short of students‘ demands last week that all the desks and chairs in the classrooms be replaced. According to news reports, the 27-year-old suspect surnamed Park allegedly trespassed into the graduate school building, posed for pictures and video while naked and shared them via his social media account on Oct. 6. The Twitter post went viral, prompting police authorities to investigate. Police had requested for an arrest warrant for Park, but the court refused, citing Park’s lack of a criminal record.